If you’re anything like me, you’re always looking for opportunities to generate more exposure for your small business. You know you have a great product or service, and if more people just knew about it, you could increase your sales. Unfortunately, it can feel like every solid marketing opportunity carries a large price tag, making most of them unfeasible. 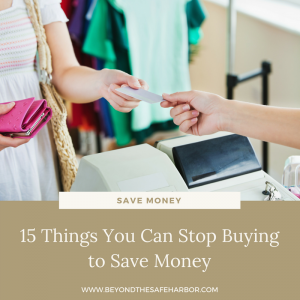 With that in mind, this post will cover 10 affordable (and often FREE!) ideas for how to promote your Etsy shop. These are all things I’ve tried over the past 2+ years as an Etsy shop owner, and they’ve helped me build my business on a budget. How to Sell Things on Etsy: What You Need to Know An introduction to selling on Etsy. This post covers what you can sell, how running a shop works, and all about Etsy fees. In other words, how earning money really works. How to Start Selling on Etsy Successfully A step-by-step guide to actually setting up shop including determining what to sell, naming your shop, sourcing your materials, pricing your products and shipping costs, photographing your products, and actually listing them. Making Money on Etsy: How I Doubled My Income on the Cheap The steps I took to double my Etsy income. It’s a case study into what has worked best as I’ve grown my business. How to Use a Lightbox for Product Photography How to take great product photos on your own, including the products and tools I use every time. #1: Use the Etsy Promoted Listings feature. One of the best ways to promote your shop is to do so within the Etsy platform. (If you’re not familiar with Promoted Listings, you can find the feature by navigating to your Shop Dashboard -> Marketing (left hand menu) -> Promoted Listings). For a budget of as low as $1USD per day, you can promote your listings. What this entails is Etsy showing your listings to customers searching for relevant products. It helps you get on earlier search pages and in prime locations so that more people see your products. As you can see in the screenshot below, when I searched “silver drop earrings”, the very top of the search results shows 4 Ads – each of which are a promoted listing. I’ve highlighted the Promoted Listings section in the orange rectangle, and highlighted with a blue circle where each listing is marked as being an Ad. Within the Promoted Listings feature, you can choose which items are featured, whether new listings are promoted, and even set your maximum cost per click. You can turn on and off Promoted Listings at the click of a button, and monitor it over time to see how well it’s performing for you. Here’s a snapshot of the Promoted Listings results I’ve received for my shop over the past 7 days from the time of writing. As you can see, it has cost me $17.18USD and generated $88.17USD in revenue. This is a solid ROI, especially given my profit margins are healthy. 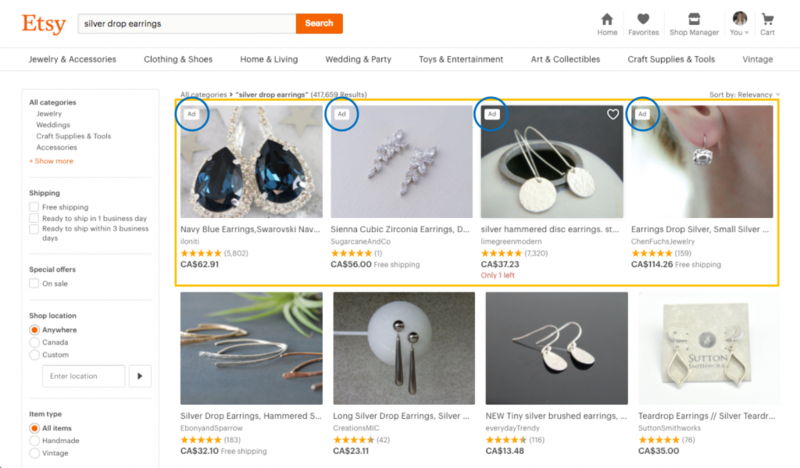 Promoted Listings are a great low-cost way to test promoting within the Etsy platform itself. 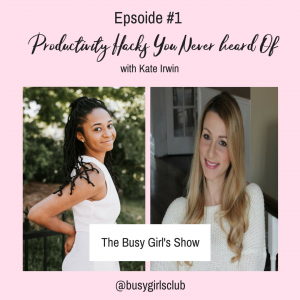 I share more details about this in my post about how I doubled my Etsy income. Essentially, a promotional calendar involves a consistent stream of discounts, events, and “news” around your shop. It gives you something to talk about on social media, gives your customers a reason to shop, and creates a sense of freshness around your offerings. Sending a weekly email to your email list, if you have one. Having one day each week where you discount a rotating set of listings. For example, every Tuesday I used to run $2 Tuesday and discount 2 sheets of stickers. Offering freebies with purchase on certain days. I used to run Freebie Friday weekly to do just that. Releasing new items on a set schedule. For example, every Thursday I release at least 6 new products. This calendar means there’s always something going on with my shop to keep customers engaged. 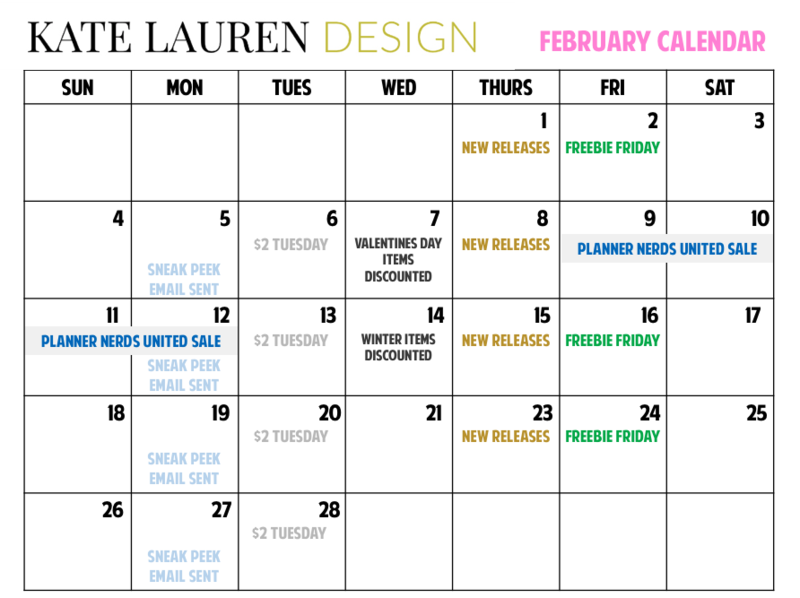 Here’s a snapshot of the February Promotional Calendar I released for my shop this year. I promote each of these events the day of too, but this shares an overview of what I run in a given month. Leverage the power of community by teaming up with other businesses to reach your ideal customer.The key is to expand your reach by alining with others. The best way this has worked for me is through a group sale. If you’re not familiar with group sales, they involve a bunch of shops offering discounts under one umbrella during the same time period and with the same coupon code. For example, in early January, I participated in the Planner Girl Exclusive group sale. There were a group of (30-50) planner-related shops that all participated and promoted one another and the sale as a whole. For 5 days, customers could use the same coupon code to receive discounts at all shops. You can choose your discount amount to ensure your profit margins are protected, and in most cases the increase in volume will outweigh the revenue lost in discounts. Group sales are a great opportunity to network with other shop owners, get your shop out there to prospective customers, and drive a lot of revenue through discounted prices. Since customers tend to repurchase from their favourite shops, it drives trial that can turn into a long term relationship. I’ve been a part of a bunch of giveaways since opening my shop, both group and individual. Often giveaways involve asking for a specific action (a follow, comment, tagging a friend, etc.) in return for an entry. Group loop giveaways are a fun way to grow your following by leveraging other shops. They often involve a bunch of similar shops each contributing shop credit, so that the ultimate pool or prize winnings is substantial. By encouraging followers to follow every shop, everyone wins. Here is where you have more control over the prize and process. Before launching your giveaway, give some thought to what behaviour you’re looking for. 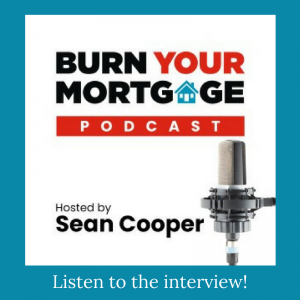 Are you trying to drum up sales? Maybe for every order placed during the month, a customer receives one entry to win a grand prize. Looking for suggestions on new products? Have social media followers comment their requests on a post and randomly choose a winner to win shop credit. As I mentioned in my case study, as a business owner, your email list is arguably one of your biggest assets and one to foster and grow. It lets you communicate regularly with your customers in a way that is more direct and intimate than social media and is a fantastic tool for communicating sales and news, and promoting your shop. If you’re just starting out, a free email provider is all that you need! I run my Etsy email list with Mailchimp, which is free up to 2,000 subscribers and is easy to use. I’d also recommend MailerLite (free up to 1,000 subscribers!) which I use for my blog email list. First, through a sign up form embedded in my Kate Lauren Design Etsy shop Facebook page. Second, through Instagram direct messages. When I promote my email list, I invite followers to DM me their email address and I add them manually. It’s easier for them, and so far the volume has been manageable for me! Think of a PR team like a group of shop cheerleaders! They’re extended members of your team who promote your sales, new releases, and products, in exchange for free product and a discount code to share with their followers. I’d recommend trying this out for a few months with a small group of people before expanding it further. It can be a lot to manage when you’re sending them promotional information ahead of time and sending out PR packages regularly. To reinforce your exceptional products and customer service, share your reviews! Screenshot some of your favourite and most positive reviews and share them on social media. Not only does this give your customers a shout out, but it reinforces the great experience new customers can expect when they buy from you. Make sure that before sharing any names on social media you check with the customer who left the review. They may prefer you share it anonymously. Find other shops, retailers, or businesses that cater to your target market and offer to provide them with samples for distribution. This is a great way to get your product in people’s hands so that they can see, touch, and feel it first hand. And this is especially valuable when you sell online as that can be the biggest barrier to purchase. To get my products in more people’s hands, I’ve sent sampler sheets to several shops to include in kits and orders. So far, it hasn’t had a big impact for my shop, but I’ve heard from other shops that it’s been fantastic for their sales. Posting all promotions, sales, and news (see idea #2!). Sharing sneak peeks and behind the scenes pictures and videos. This makes my social media followers feel like an inner circle, gives them exclusive access, and engages them in my shop happenings. Using multiple features (for example, in Instagram I use the Feed and Stories, promotional images and videos, etc.). Asking for feedback and requests to keep it an open dialogue. Probably the most important thing in getting eyes on your product is to have great photos. A great photo is accurate, descriptive, shows the product from multiple angles, brings it to life, and makes it feel real. As I mentioned earlier, one of the biggest challenges of online shopping is that the customer can’t see the product in person. They can’t touch it, feel it, or examine it. Great photography helps to break down those barriers. It also gets likes, comments, shares, and followers on social media which expands your reach. While I’m by no means a pro photographer, Etsy has some great articles about product photography that I’d recommend checking out. You’ll definitely want to take multiple high quality photos of each product before listing them. 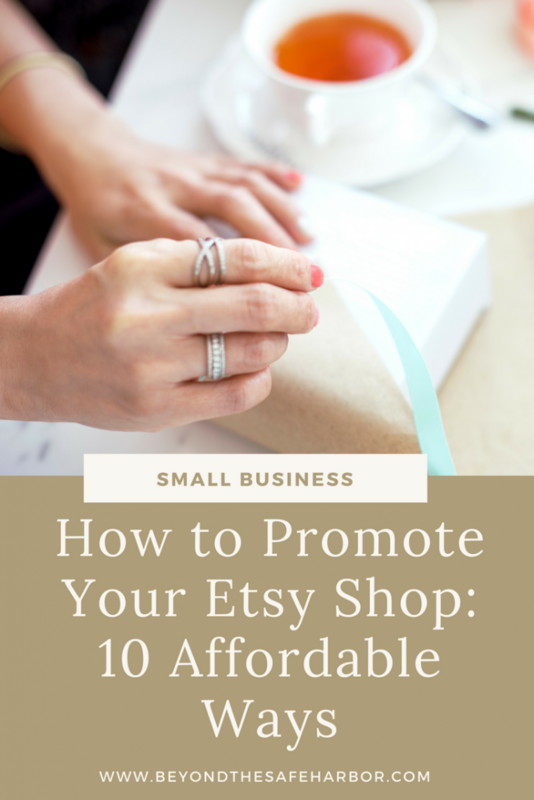 So there you have it – 10 affordable ways to promote your Etsy shop. Have you tried any of these tactics? Or have other strategies worked for you? Leave a comment and let me know!